As if a request were put in for the perfect weather to usher in the Monroe County Fair, Mother Nature delivered with cool temperatures and fair breezes for the kickoff of the 71st annual event. The Junior Class Horse Show opened the week-long event Sunday afternoon, followed by a Kloepper card tournament. New this year, the carnival rides opened Sunday and thrill seekers came out in force. For a full schedule of fair week events, click here. 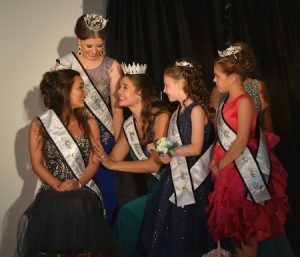 Sunday evening’s main event — the Little Miss and Fair Queen pageants — took place on a picture perfect night, with the 18 girls participating the only things lovelier than the weather. The Little Miss pageant was emceed by 2017 Fair Queen Alexis Hartman and 2017 Little Miss Savanna Cissell, with Brandon Luttman serving as master of ceremonies. The 10 Little Miss contestants — Mira Tullis, Carly Jane Unger, Claire Stafford, Lillian Kolweier, Sofia Rauh, Kehrington Schultheis, Kaleigh Halleran, Skylar Newton, Blair Felix and Cambree Comte — took the stage first, delighting the crowd as they answered questions posed by Hartman and Cissell, and demonstrated their knowledge of the long history of the Monroe County Fair with each sharing a fact she learned. As the girls performed a dance to Megan Trainor’s “When I’m Dancing,” led by choreographer Cissell, the judges tabulated scores and when it they returned, Halleran was crowned the 2018 Little Miss. Kaleigh wore a bright pink sleeveless dress with a pickup skirt and jeweled belt, and her brown hair pinned in a curly updo. She is the daughter of Jim and Amy Halleran of Waterloo and was sponsored by Gateway FS. She will be a second grader at Rogers Elementary this fall. In one of the largest fields in recent memory, eight young ladies — Taylor Gummersheimer, Emma Boehm, Bethany Brinkman, Alison Yearian, Noella Hosick, Kaylee Fisk, Hanna Meadors and Belle Plew — took the stage in business attire and each gave a brief speech about herself. Gummersheimer, 19, of East Carondelet, is the daughter of David and Connie Gummersheimer and was sponsored by Jatho Plumbing. She wore a light turquoise jeweled trumpet dress with a chiffon overlay. She spoke about the impact being a member of the Columbia High School FFA has had. Boehm, 20, of Waterloo, is the daughter of Dwight and Liz Boehm and was sponsored by Waterloo Animal Hospital. She wore a deep blue shimmering fit-and-flare dress with a halter neckline. She spoke about the importance of knowing the love of a cherished pet. Brinkman, 19, of Valmeyer, is the daughter of Bruce and Rita Brinkman and was sponsored by Wm. Nobbe and Company. She wore a navy dress with jeweled lattice design on the bodice and a fit-and-flare skirt. She spoke about the people who had the greatest impact on her life. “Watching me take care of my dogs (Dr. Shannon Melliere) gave me the opportunity to work with her. She has inspired me to pursue a career in veterinary medicine,” she said. 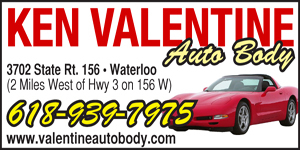 Yearian, 18, of Waterloo, is the daughter of Brad and Amy Yearian and was sponsored by Sander Auto Electric. She wore a blush dress with a jeweled bodice with a v-neckline and box-pleated skirt. She spoke about working with special education students. “This has driven me to want to become an occupational therapist,” she said. Hosick, 18, of Columbia, is the daughter of Tina Comte and Timothy Hosick and was sponsored by Curtis Jewelers Floral and Design. She wore a black fit-and-flare dress with a gold lace bodice overlay and chiffon skirt. She spoke about the importance of protecting the oceans from pollution and animal extinction. Fisk, 18, of Columbia, is the daughter of Amy and Chris Felix and was sponsored by Brian Kish with Thoma and Associates Tax Professionals. She wore a garnet mermaid dress with a jeweled geometric design throughout and halter neckline. She spoke her strong ties to the community through her farming roots and how they have inspired her to serve others. Meadors, 18, of Waterloo, is the daughter of Jennie and David Meadors and was sponsored by Miller Construction. She wore a jeweled eggplant dress with a mermaid skirt. She spoke about her friend Max Paul, a Waterloo High School senior who died unexpectedly in February after a short illness complicated by muscular dystrophy. Plew, 17, of Columbia, is the daughter of Dennis and Rhonda Plew and is sponsored by 24/7 Onsite Cameras. She wore a black jeweled strapless dress with a chiffon trumpet skirt. She spoke about women’s rights and about one of her personal heroes. “Malala Yousafzai was shot in the head seeking better educational opportunities for women,” Plew said, urging everyone to visit Malala.org for more information on her fight to increase access to health care and economic opportunities for women around the world. Following a swimsuit appearance and two more rounds of questions, the judges were ready to crown Plew as this year’s Monroe County Fair Queen. Plew will have a busy week. She and Halleran will present ribbons and trophies to the winners of each event and competition. She would also like to use her own special talent to share her appreciation for Monroe County agriculture and for the fair. “I would like to give back to the community by singing the National Anthem at any Monroe County Fair events I could,” she said. For photos from the pageant, which are available for purchase as prints, click here.